Fungal nail disease may result in pain, impair the ability to walk and contribute to a negative self-image. It is usually characterised by thickened, yellow or crumbling nails and can be accompanied by a foul odour. Fungal nail disease, medically referred to as onychomycosis, affects 2-14% of the adult population. Fungi that feed on keratin, a structural protein within your nails, frequently cause the condition. Fungal colonies proliferate in moist environments and invade the nail bed by penetrating the margins of the nail. Often this condition is left uncured for a long time, due to embarrassment or frustration by other treatment options. These include prescription medications, which have side effects and therefore are not always the best treatment option. Another option is surgery to remove the nail, which is not practiced by Performance Podiatry due to the high incidence of recurrence and the potential for permanent nail deformity. Laser therapy to treat nail fungus is gaining popularity as a means to achieve a temporary increase in clear nail, due to the increasing evidence for its application. 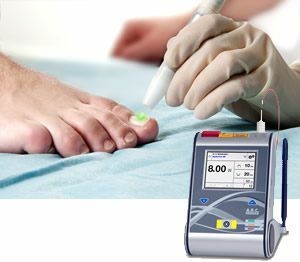 The choice by Performance Podiatry to use the Fox 1064 Diode involved a considerable amount of research into the lasers available on the market, and this trumped due to its safety, reliability and remarkable formal published outcomes. The FOX laser emits near-infrared light at a wavelength of 1064 nm that passes through the nail plate and into the nail bed, resulting in heating of the fungi. Exposure of fungi to high temperatures inhibits their growth and replication, result is an increase of clear nail. The laser energy passes through the nail without causing damage to adjacent skin or nail. Only laser can penetrate this effectively through to the nail bed. During the laser treatment, the laser will be slowly directed across the nail bed. The laser beam will generate heat beneath the nail and within the underlying fungal colony. You will feel a warm and often slightly painful sensation during the procedure. As the laser has no effect on healthy tissue, there are no side effects. Results are not immediate, but rather as the nail grows you will notice new, healthy growth from the nail base (epynichium). Nails grow slowly so a complete result is observed months following the procedure. All of the published studies show a positive result in over 80% of cases. However, a second treatment may be indicated for severely affected nails and persistent fungal strains. Your Podiatrist will discuss the possibility of having additional treatments and will also advise you on the proper care of your nails to minimize the risk of recurrence. Conclusion:The study evaluated and confirmed the effects of 1064 laser on fungal tissue. Clearing of the proximal nail was observed in 83%of the patients 2 months post treatment. The laser therapy is safe, well-tolerated and very effective in the treatment of onychomycosis to promote clear nail growth.